I bought more stuff. I couldn't help it, and it's not my fault, and ... other blame-diverting words. It all started here with a blogpost about this teapot, shaped like an espresso maker. I think this so cool! I want one!! It's all mixed up, just like me. Then I just need to find a coffee maker shaped like a teapot. Heh. So I went in search, but I couldn't find anything on it. Nada. Zippo. And Colin of the CoffeeCrew doesn't say where he found it. I tried the Teapots, Teapots blog, but couldn't find it there either. BUT, I did find a post about interesting spot called TeaPot Island in Kent. The photo shows a woman standing next to a ginormous teapot fountain. Another must-visit place to add to my travelogue, for sure! There's not much detail on the Teapot Island website, but they do have a VERY interesting photo gallery of unusual teapots. That was good for an hours' worth of diversion, but then I continued my search, and landed eventually at The English Tea Store, where they're having a closeout sale on some of their teapots! So ... well, you know how it is. I had to. It was a moral imperative. I bought two Amsterdam teapots, one large, one smallish. Very cute, very cheap, even with shipping. See, isn't it cute? I am now putting the credit card away, in a box, high on a shelf, behind something really heavy and difficult to move. 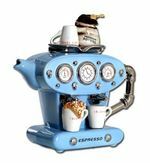 The espresso teapot is made by The Teapottery in Yorkshire England. Hey Rich, thanks for your comments. I really like knowing something I've written has touched somebody. KeeWee, I don't know anything about Strandtea.com. I'll have to have a look at their site. Hi Christine, I have just given my credit card a workout at the English Tea Store. do you know anything about this company? I just found BTW and this site as your alternative Universe. I need to read more before I can offer anyone an understanding of who you may be but your preChristmas notes hit home. Like you I have determined I have lost me. You use your inner child as self for me its just me. Very few things reach me anymore, life is dull and relentless. At best it is silent-no humor, laughing at jokes has gone. I need to punt and run to a "meeting". Since I have little time at this momement and suspecting you may not care for details from another I just wanted to let you know your comment touched me and to say thanks for that. I can certainly understand buying the teapot, though. It looks like it'd feel good to pour from, etc.